“Gwatney Blinkytoes” from Christian Faith Publishing author Jeffrey Baer is an encouraging story about a new beginning that shares a heart-warming adventure with young readers. When Mark picks a mystery box as his present for his eighth birthday, amazing things begin to happen. “Gwatney Blinkytoes”: a heartwarming story for young readers that teaches positive values. “Gwatney Blinkytoes” is the creation of published author, Jeffrey Baer. Jeff was born and raised in the San Francisco Bay Area and now resides in Idaho. Since early childhood, Jeff's life has been filled with and inspired by kids and adults with special challenges, which have encouraged some of the stories. As a Bible-believing, born-again Christian, Jeff has enjoyed working with children for over thirty years, as a Sunday School teacher, Vacation Bible School teacher, has conducted in-home Bible classes for kids, and has done a lot of babysitting. Published by Christian Faith Publishing, Jeffrey Baer’s new book contains positive values for children, and the characters have a lasting quality. Young readers will find lots of laughter and encouragement between the pages of this first chapter book. The story also contains an unexpected twist which will surprise the readers and warm their hearts. One who was always last, was first on that day. View a synopsis of “Gwatney Blinkytoes” on YouTube. 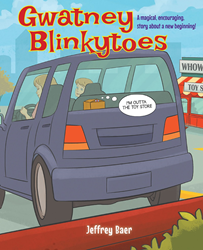 Consumers can purchase “Gwatney Blinkytoes” at traditional brick & mortar bookstores, or online at Amazon.com, Apple iTunes store, or Barnes and Noble. For additional information or inquiries about “Gwatney Blinkytoes”, contact the Christian Faith Publishing media department at 866-554-0919.